Cothorne told “Frontline” that she reported the incident to the central office, but to her knowledge nothing was done. School system officials said Friday that without having seen the documentary, they could not comment on Cothorne’s allegations. Rhee claims that the Inspector General’s report clear her of accusations. Nevertheless, the Post claims the IG’s report was flawed. 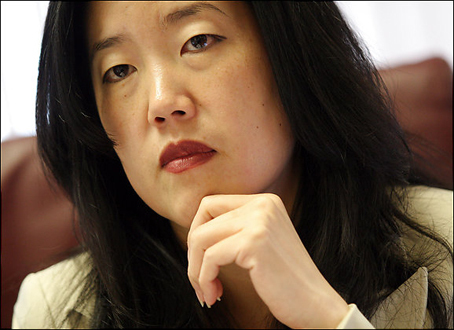 The District’s test scores did rise during Rhee’s tenure, including a particularly dramatic jump after her first year in office. Rhee left office in 2010 after then-Mayor Adrian Fenty, who had hired her, lost his bid for reelection. She then launched Students First, a national lobbying organization to spread the reforms she championed in Washington. But in 2011, USA Today published an investigation that raised questions about the validity of the District’s test scores — and, by proxy, about the effectiveness of Rhee’s reforms. The newspaper’s report revealed an unusually high number of wrong-to-right erasures on students’ answer sheets at more than 100 D.C. schools between 2008 and 2010. Such erasure rates aren’t proof of cheating, but they are signals of potential tampering. Current Schools Chancellor Kaya Henderson asked D.C. Inspector General Charles J. Willoughby to investigate further. Willoughby reported in August that he’d found no evidence of answer-sheet tampering, a conclusion that Henderson said should finally put cheating allegations to rest. The “Frontline” documentary, however, suggests the inspector general’s investigation may have been incomplete. The 17-month probe focused on just one school: Noyes, which was named a National Blue Ribbon School in 2009 after students made impressive gains on reading and math tests. It also twice won an award from Rhee that brought cash bonuses for staff, and it had some of the highest erasure rates in the city. Investigators found some test-security problems at Noyes but no evidence of answer-sheeting tampering. Based on those findings, they decided not to examine other schools. But Cothorne, the former principal who alleges that she saw staff members after hours with erasers and test booklets, said investigators never interviewed her. I am not sure we will ever know the truth about the “cheating scandal” or Rhee’s role in it. Did Rhee do damage to the DC educational system? I think it is clear that she did. Unfortunately, the damage Rhee is currently engaged in goes far beyond Washington D.C. schools. The lobbying group Rhee currently heads, “Students First”, is intent upon spreading the “reform model” she used in D.C. throughout the nation. Tomorrow I will talk about the impact of Students First on Idaho and the bogus “Report Card” the organization recently released claiming to grade the States on educational reform.